CBS journalists were filming a beach in South Pass, Louisiana, when, according to CBS, a "boat of BP contractors and two Coast Guard officers told them to turn around or be arrested." 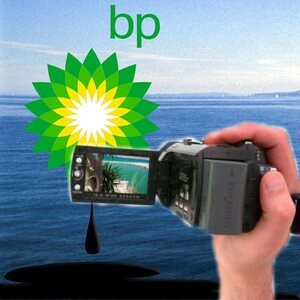 The incident is thought by bloggers tracking the oil leak in the Gulf to not be the only time that BP has challenged the right of journalists to film. If in fact BP has instructed crews to specifically regulate and turn away groups with video cameras or even still cameras, this raises many questions about what Americans are able to access and not access, what theyare able to document and not document. Should a person have to be embedded with authorities, corporations or organizations at the center of a disaster in order to document a disaster? Must a person be with a recognized news organization that regularly gets into press conferences in order to film critical events like the BP oil leak in the Gulf of Mexico right now? Journalists were told by "someone aboard the boat" this is BP's rules, not ours. That alone would be enough to seriously question the situation and ask why citizens should have to follow rules and only document what authorities, corporations, or organizations involved grant citizens permission to document. But, the Coast Guard was present and they released a statement on the matter that was published by the Mother Nature Network. "CBS Evening News reported they were denied access to oiled shoreline by a civilian vessel that had clean-up workers contracted by BP, as well as Coast Guard personnel on board. CBS News video taped the exchange during which time one of the contractors told them (on tape) that " ... this is BP's rules not ours." Neither BP nor the U.S. Coast Guard, who are responding to the spill, have any rules in place that would prohibit media access to impacted areas and we were disappointed to hear of this incident. In fact, media has been actively embedded and allowed to cover response efforts since this response began, with more than 400 embeds aboard boats and aircraft to date. Just today 16 members of the press observed clean-up operations on a vessel out of Venice, La. The only time anyone would be asked to move from an area would be if there were safety concerns, or they were interfering with response operations. This did occur off South Pass Monday which may have caused the confusion reported by CBS today.